Last week was earnings weeks for Tesla. We are going to change up the report a bit this week and discuss the top 5 FUD headlines before going into the regular #Pravduh about #Tesla report. My “kudos” to CNBC for covering Tesla in every which way possible, some of which I didn’t know existed or wanted to exist. I’ll start with two CNBC pieces. Who cares about anonymous shorts with a website? Why don’t they reveal their names like real journalists? Why is a major news site reporting on this and giving them importance? Does CNBC report when longs create their own website anonymously? That’s all that needs to be said, right? Why is it hard to say Mr. Ahuja “retired?” He retired the first time, Elon asked him to come back, he did, made a difference, and is now retiring following Tesla successfully navigating the Model 3 launch. Leaving can mean many things — retiring is very specific. This is a repeated short/#Pravduh claim. Tesla is cooking the books, something is not right, something doesn’t add up. These are serious claims that can get an auditor fired and top executives in jail. I gave Mr. Johnson the benefit of the doubt. I listened to the podcast. I can give some credit to the Bloomberg hosts (very rare), as they called out Mr. Johnson for saying he thinks Tesla is massaging the numbers. Mr. Johnson says Tesla will not have enough cash to make the March payment. I disagree. 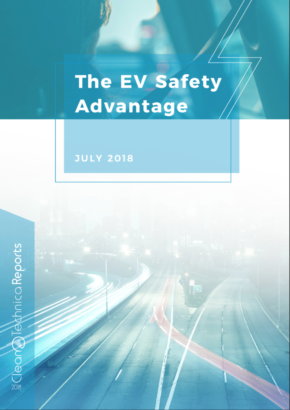 If there is fraud by Tesla, Mr. Johnson should pursue it or raise it with the appropriate authorities. But I think it’s simply a scandalous claim. There is too much on the line for Elon and Tesla to pursue such shenanigans. Elon and Tesla are committed to the long haul. Claims of fake numbers and fraud are getting old. 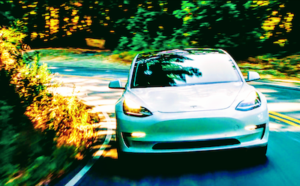 Even though Tesla had record deliveries, it had challenges: Auto tariffs which led to lowering prices in China to not affect consumers, a lower Model 3 ASP from the introduction of the Model 3 Mid Range, very little revenue from ZEV and GHG credits. Through it all, Tesla turned a profit. It was the first time Tesla turned a profit for two quarters in a row. This is something “the experts” claimed Tesla couldn’t achieve, certainly in 2018. Q1 2019 will be challenging. Everyone knows that. Many cars will be loaded on ships heading to Europe and China. 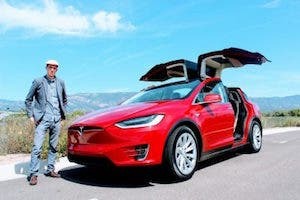 On the conference call, Elon said they see deliveries growing 45% to 65% in 2019! This range includes if a global recession takes place. Although accounting profits may be shrinking in Q4 and Q1, Tesla continues growing the business. 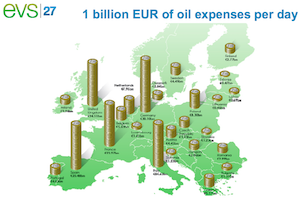 They expect profits and strong cash flow in Q2 through Q4. It’s better to have minimal accounting profits, pay little tax, and invest heavily in the business. Establish a strong position and accounting profits will come for Tesla. Tesla is a multinational business. They have business in America, Europe, Middle East, Asia, and Australia. It would be odd for a CEO not to travel to attend ceremonies (China) or launch major new projects (Australia). What’s lost is how much CEOs in other companies in the same industry spend for travel. Is it more or less? How much more or less? By itself, the $700,000 tells me little. The context is missing. Without context, it just seems mean-spirited to drag Elon’s name through the mud before the Tesla earnings call. Elon also runs SpaceX, of course, which has significant activity in Florida and Texas, as well as California. On a final note, since Chanan was very busy, I took on #Pravduh this week to help him out. It is my final week working on pulling headlines for #Pravduh. Chanan will take over full time next week, except that I will vote and help with heavy weeks like this one. 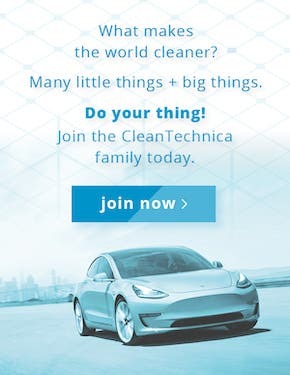 The reason is simple: I have many other articles to write on other Tesla and other cleantech topics. 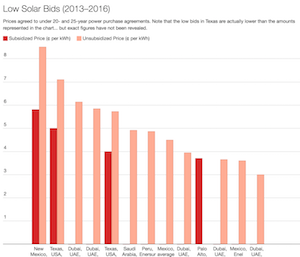 Tesla is in a better place, more people are aware of #Pravduh and paying close attention to the media. I set out to support Tesla at a crucial time with this project. Thank you to all the wonderful people I have met and interacted with on the way! I hope my efforts have made a difference. It is still my goal to meet Elon, meet the Tesla team, and buy a Tesla one day. Remember that each week we share the raw data (headlines and scores) for #Pravudh. You can scan through yourself if you want to double check our findings or just see the headlines. And you can check out our own Tesla stories for more context and comparison. 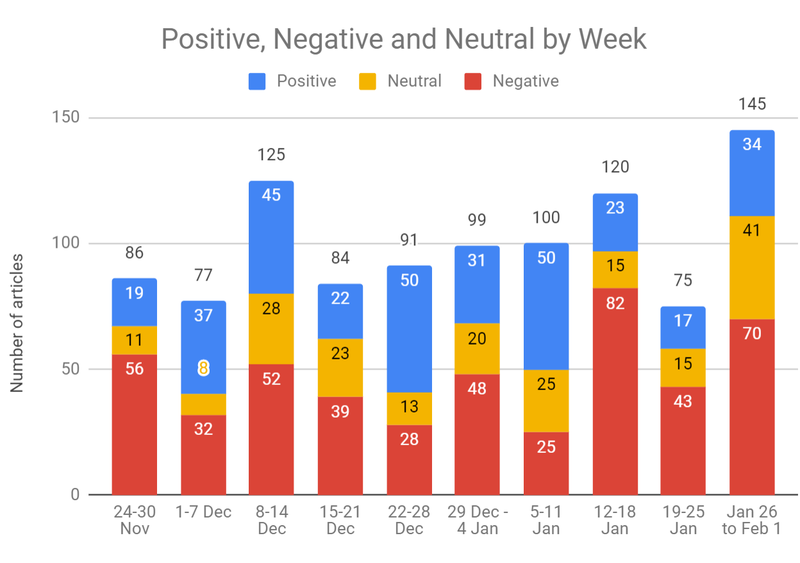 For details about our methodology and broader context about this weekly analysis, see Pravduh About Tesla report #12. 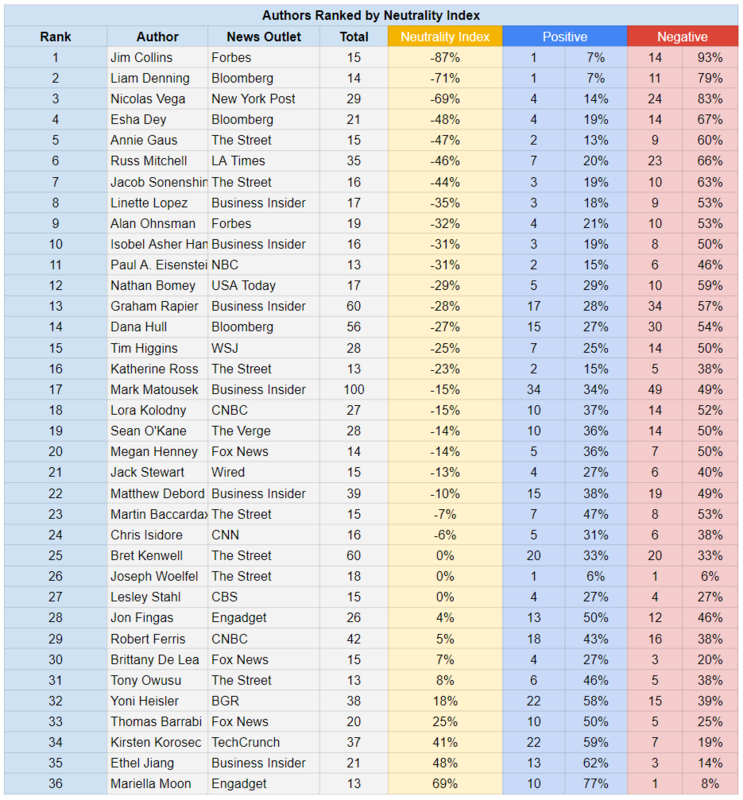 For this entire section, note: At major media outlets, there are often headline writers who control this part of articles, but we find tracking the authors is also interesting and potentially useful for considering what kind of stories the authors tend to write. Adding onto the summary in the intro, here’s a summary of Tesla news and potential news ordered by day. You can consider for yourself what were objectively the important updates in the “Tesla story” last week. The more these #Pravduh About #Tesla reports get shared online through social media, the more people will take notice. If there is an ongoing heavily negative slant about Tesla in certain outlets — even as Tesla has so much positive news to share — people should be aware of this and approach each new story with that in mind. Again, here is the data from this past week in case you want to have a closer look at the raw data. 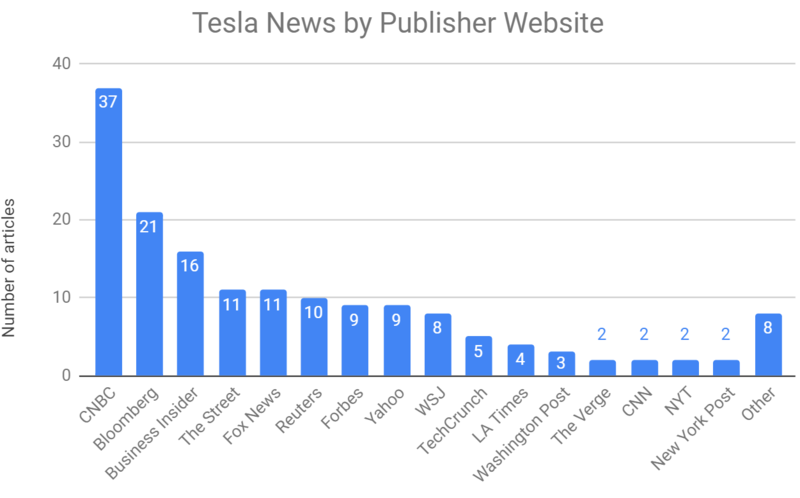 For details on our methodology and broader context about this weekly analysis, see our previous Pravduh About Tesla report.